Like the Holy Bible, these verses were written at the very beginning of the Tai Chronicle. Then, it continued with a narration about the creation of human beings and animals, the sinful acts of human beings, the punishments from God such the Earth torching and the great flood, the re-population of Earth, etc. Above was the big picture of the Tai belief. Somehow, we still believe and honor the powerful Great God who created the universe, human beings and animals. The following legend, Human and the Turtle, had reflected our belief and also complemented our culture. Long, long time ago, Thaen Luang or the Great God wanted to test the love of all mankind and animals towards their Creator. One day, Heaven announced that the Great God had died. There was an order throughout the universe that all should come to Heaven and pay their last respect to God. So representatives of human and all animals started their journey to Heaven. The road to Heaven was not smooth, but rough with rocks and fallen trees. However, human and animals managed to overcome the obstacles and slowly advanced to Heaven, but not for one specific animal. With short legs and heavy shell, the turtle faced many difficulties. At one point, the turtle was blocked by a big fallen tree. It had tried many times to climb over the trunk, but fell back all the time. Many animals passed him by without helping. By a chance, a human arrived and saw the poor turtle. The human said, I will help you and carry you to Heaven with me. He picked up the turtle and stuffed it under his armpit. Together they continued their journey to Heaven. Finally arrived at God’s palace, human and animals found the Great God lying dead on a golden bed. They all knelt down on the floor in front of the bed. The turtle whispered to the human’s ear, “Whatever I say, you should repeat after me.” Then came the time of weeping, all animals cried out, Di Laay Meung Nhang Tak, Di Lak Meung Nhang Taay. That meant, Luckily you died. At the same time, the turtle cried out, Thaen Taay Baw Hu Zu, Pu Taay Baw Hu Kin. The human then repeated exactly as what the turtle just said, which meant, God died, I do not know how to stay, Grandfather died, I do not know how to eat. The Great God suddenly rose up from the bed and furiously yelled, You, all animals, are treacherous against me. You wanted me to really die. From now on, you won’t have an eternal life as before. You will die and die young. Only human and the turtle sincerely love me. They will live long, much longer than any animal. From that day, all humans and animals have to die. Only humans and turtles live longer. As of today’s truth, it’s scientifically proved along that legend: only turtles and humans live longer than most animals. Some people live more than one hundred years, and turtles live longer. 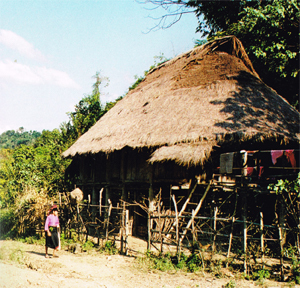 Due to the high respect of humans to the turtle’s help, the Tai people build their houses with roof shaped like a turtle shell. They also recommended their people not to eat turtle’s meat, ever.